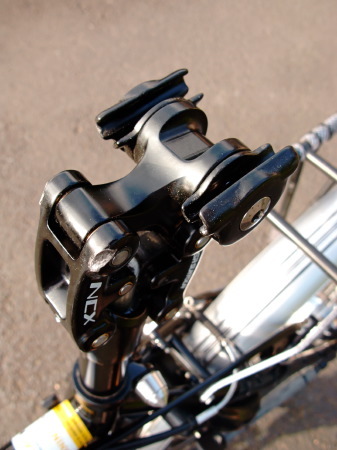 A suspension seat post can be a useful thing if you are a hard-tail mountain bike rider. It is important too for the long distance cycle tourist to make the bike as comfortable as possible. 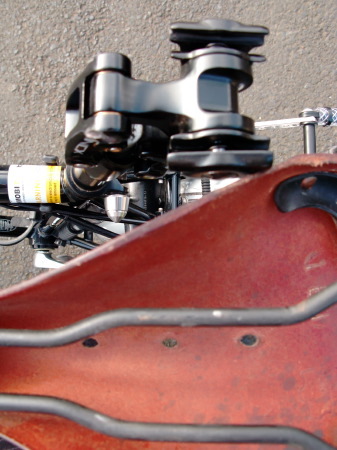 A good suspension seat post removes the lumps and bumps and generally makes the ride a bit more comfortable (together with the trusty steel frame). There are simple seat posts with a spring to absorb the rough stuff. SJS Cycles have a good range of suspension seat posts. 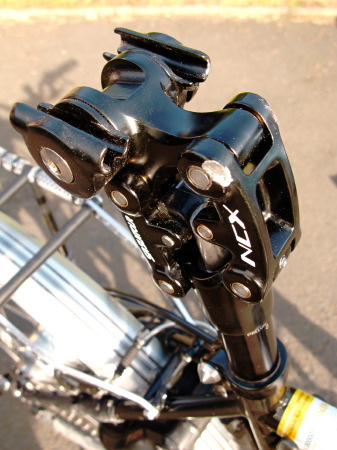 There are also several makes of the parallelogram style post such as the Crane Creek Thudbuster and the SR Suntour SP12-NCX. The idea of the parallelogram design is to minimise the shortening of the operating distance between the saddle and the pedal. This improves contact with the bike as well as maintaining the position of the rider in relation to the geometry of the bike. I decided to go for the SR Suntour SP12-NCX. It was redesigned in 2012 boasting improved brass bushings. Travel is 50 mm with a rider weight range stated as 60-100kg. The on-line reviews seemed good and the price was quite a bit less that the Thudbuster. I had also read that the Thudbuster can bounce up and down a bit depending on the combination of elastomers used. I have never used the Thudbuster but it also seems very popular. I was looking for a solid seat post that would only absorb the bigger bumps and pot-holes without loss of power transfer caused by a ‘bouncing’ saddle or saddle with springs. 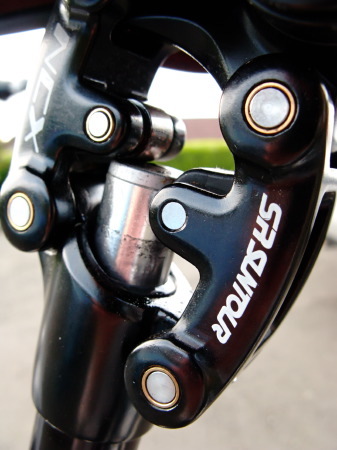 Full technical details of the SR Suntour SP12-NCX, can be found on the Suntour web site. The Suntour arrived in plain packaging which is how they are supplied in bulk to retailers. I purchased it from Practical Cycles in Lytham in Lancashire, England. They provide a wonderful range of utility bikes and bike parts. Service and delivery were excellent. On arrival I was a bit concerned about the fit. The above photograph shows the upturned Brooks and the seat post top. 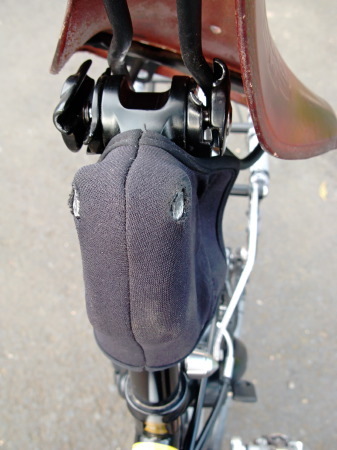 With the B17 Select saddle there is not much forward-aft adjustment possible with only about 6 mm of leeway available. Perhaps a small Suntour redesign would sort this out. I fitted it without a problem though. I was able to set up the bike into a comfortable riding position despite this limited adjustment with the Brooks saddle. The point where the post would operate was tested by cycling over some bumps and pavement edges. The adjustment as delivered was almost ideal for my weight (71 kg). After tightening a little by adjusting the hex bolt in the seat post the correct setting was established. On numerous day rides I liked how the post would only absorb the larger bumps. There was no bouncing and in operation the post would absorb the bump and immediately return to a solid position in one action. I was happy with the purchase. A neoprene dust cover adds protection to the moving parts. This was purchased separately. This Summer I set off to complete the North Sea Cycle Route. The seat post performed well on a variety of surfaces from smooth Norwegian roads, rough forest track in Denmark, tree roots under some Dutch and Belgian cycle paths, sand dune cycle paths, to pot-hole damaged sealed and gravel roads that we love to nurture in the UK. Really big bumps and holes were handled with confidence and no doubt prevented some serious back jarring and possible injury. The instant return to a solid seat post position after a bump helped in controlling the bike on rough terrain and complimented the Thorn Raven Tour’s inbuilt stability. It is a fit-and-forget item once the correct spring tension is set for your weight and preference. During the trip I examined the post a few times and discovered that the top had been rubbing against the Brooks saddle rails each time the post absorbed a bump. There was some wear to the corners of the post. There was no damage to the saddle rails other than the black paint having being worn off. There was no sign of any rust on the saddle rails. The wear in the photograph looks worse than in real life and has not affected the bushings. After 14 weeks of daily use, and over 6200 km, the seat post performed very well. Initial spring tension remains as it was set before the tour. 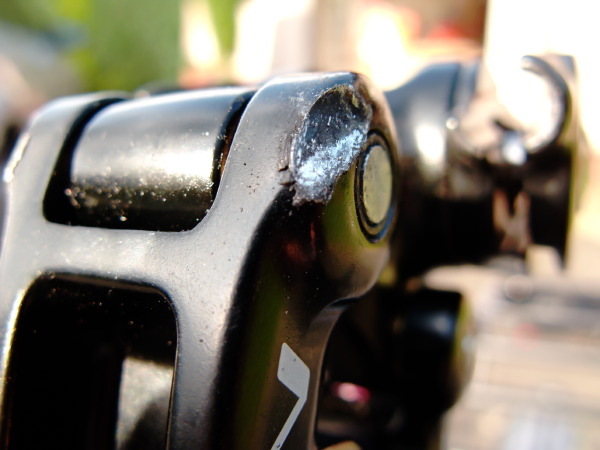 There were no indications of additional wear to the saddle rails or to the Suntour SP12-NCX. In operation the seat post now clears the saddle rails. The neoprene cover worked well. During and after the tour closer inspection of the mechanism showed little wear or signs of dust ingress. The bushings and contact points appear undamaged and intact. All in all I would recommend the Suntour seat post for your touring or mountain bike. I hope to compare it with the Thudbuster one day. For the moment the SR Suntour SP12-NCX does the job! This entry was posted in Gear, Reviews and tagged components, equipment, review, saddle, seatpost on October 1, 2013 by Richard.